A Corinthian helmet was discovered in a 5th century BC grave in the Taman Peninsula, southwest Russia, according to RIA Novosti news agency.Made of bronze, Corinthian helmets covered the entire head and neck, with slits for the eyes and mouth, protruding cheek covers (paragnathides in Greek) as well as a curved protrusion in the back to protect the nape of the neck.The helmet has a padded interior made of fabric or leather to protect the warrior’s skull. These helmets were indispensable for the Greek hoplites, the famous foot soldiers of the phalanxes, as they were highly protective because they completely covered the headOften their crest was surmounted by a crest (lophos) with a horsehair plume. The one found is corroded and highly fragmented, but its discovery is extremely significant for historical purposes. 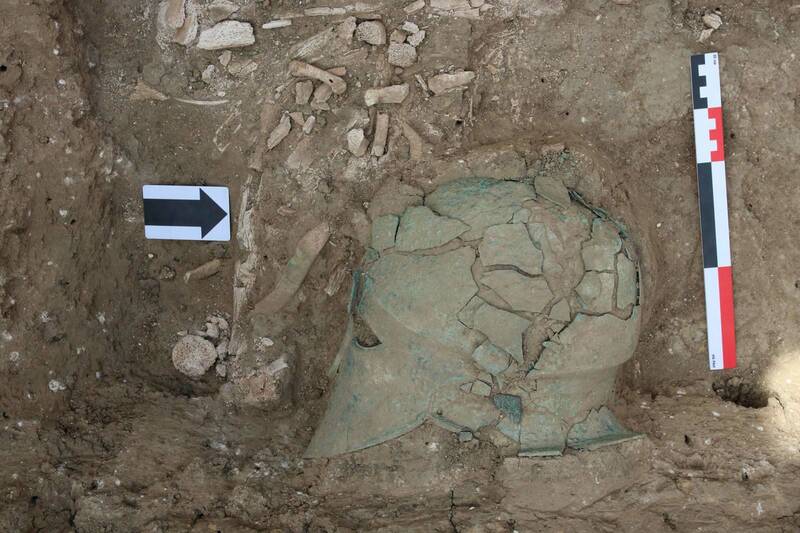 The Corinthian helmet is the only one of its kind discovered north of the Black Sea.